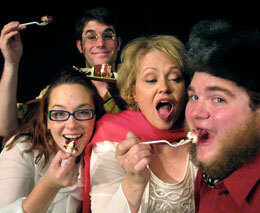 Cast members, from left, Lindsay Neinast, Harlan Post, Lou Anne Wright and Chris Wolter get into character for their roles in the UW production of "Seagulls in a Cherry Tree." The University of Wyoming Department of Theatre and Dance continues its season with "Seagulls in a Cherry Tree." Performances can be seen Tuesday, Oct. 20-Saturday, Oct. 24, at 7:30 p.m., and Sunday, Oct. 25, at 2 p.m. in the Fine Arts Studio Theater. Tickets cost $14 for the public, $11 for seniors and $7 for students. For tickets and information call (307) 766-6666 or visit www.uwyo.edu/finearts. "Seagulls in a Cherry Tree," written and directed by playwright-in-residence and professor William Missouri Downs, is the hilarious tale of two Hollywood screen writers hired by Disney to adapt Anton Chekov's classic play "The Cherry Orchard" into a new movie for Mel Gibson. Downs says that audience does not have to know about Chekhov, the famed Russian playwright, or his works to enjoy the show. While all plot details and characters in the play are drawn from Chekhov's major works ("The Cherry Orchard," "Three Sisters," "Uncle Vanya" and "The Seagull"), the subject matter of human resistance to change and the inability of most people to become actively involved in their own lives resonates with everyone. "Chekhov was a master at finding humor in the everyday and ordinary people's experience," Downs says. "He wrote about people the way that they are -- complicated and flawed and sometimes just ridiculous. His insights into what drives people to do what they do are very funny."